Foxland in Blunts, near Saltash, Cornwall sleeps 4 people. 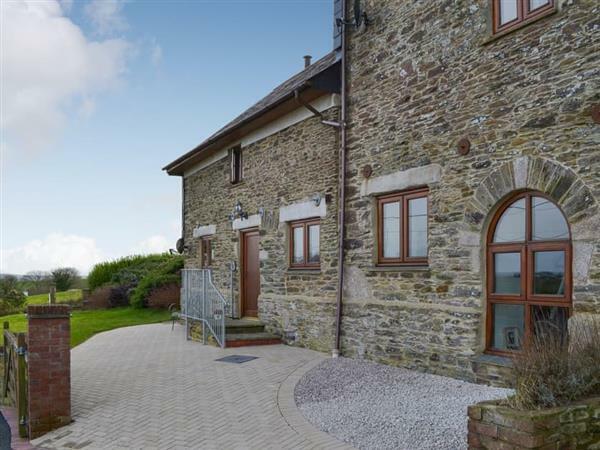 Foxland near Saltash is a rural barn conversion, set next to the owner’s home, which is ideal for either a couple or those with two younger children. Foxlands lies midway in the triangle between Saltash, Liskeard and Callington. This is a quiet spot and a great location for exploring the whole of Cornwall, with the fabulous south east coast and the great beaches at Portwrinkle and Downderry, just 20 minutes’ drive from the property. This lovely holiday property has been converted from a stone barn and is spacious, with a large open plan living/dining room/kitchen, high vaulted ceilings, striped wooden floors and a wood burner on the first floor. On the ground floor are the bedrooms which are cosy and prettily decorated and the bathroom features a spa bath as well as a shower cubicle. Outside, there is a small private patio area and garden at the side with a table, chairs and barbecue. Foxlands would suit people of all ages looking for a quiet holiday, tucked away from the hustle and bustle of everyday life. The beach is 8½ miles from Foxland near Saltash. With the shop, pub and restaurant 3 miles from Foxland. Open plan living space: With vaulted ceiling, beams and wooden floor. Living area: With wood burner and 37’’ Freeview TV. Oil central heating, electricity, bed linen and towels included. Initial logs for wood burner included. Travel cot and highchair available on request. Small garden with patio, garden furniture and barbecue. Private parking for 1 car. No smoking. Holidays at Foxland run from Saturday to Saturday. For a better idea of where Foxland is, you can see Foxland on the map below. Foxland is in Cornwall; should you be on the lookout for a special offer, you can find all the special offers in Cornwall. It's always worth checking to see what is on offer at the moment. Do you want to holiday near Foxland (UK10683), you can see other cottages within 25 miles of Foxland; have a look to find your perfect holiday location.